Every parent wants the best for their children. Establishing an environment where children can use their creative and inventive abilities will encourage the belief that they can fulfil all of their goals in life. Every human has the capacity for genius. It is how this potential is nurtured and encouraged during childhood that determines whether we achieve it. Believe in your children’s innate talents and you will instil in them a gift of self-confidence that will enable them to reach their highest potential. Children learn by example. Your own attitudes and beliefs will be the foundation for their development. So, become a child again when you become a parent. Reawaken the sense of wonder and joy in your attitude towards learning and they will make the association that learning is fun. What better gift can you pass on to your child? Kids need constant stimulation. They need to be kept amused or interested in something most of the time. This means that throughout the house there should be areas for children to be stimulated in order to feel part of the big picture. It is essential that they feel part of the family that they are able to see what goes on. There should also be one space in which they are allowed to be totally themselves (within reason, of course). 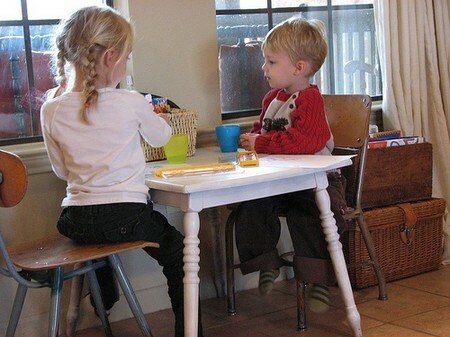 Be inventive in their personal space and make it a place where they can express their true creativity. Use uplifting colours to help the process and make the space visually stimulating. Yellow, red and orange are great colours for a playroom to boost energy and create an atmosphere of inspiration. Children need to learn their own way by doing things for themselves. Stocking their play area with creative and interactive toys is the best way to give them the tools they need. Keep a good selection of colourful books, building blocks or toys, pencils, paper, paint, crayons and games. A great solution for budding artists is to paint a wall in chalkboard paint and let them at it. What a great sense of freedom to be able to draw on the walls! Other ideas for their creative space are to have a table, at the right height, and good lighting and a warm play area on the floor for more active games. Encourage their enthusiasm by always taking the time to praise their efforts. It will make your child want to strive harder and learn more. Throughout the rest of your house, think about scale. A house must be quite overwhelming through the eyes of a child. As far as they are concerned, there are always interesting things going on above their head, but trying to reach for things ends in disaster. If children want to be involved in your day-to-day activities, find a way of letting them participate on a smaller scale. Have an area in each room where they can play. Whatever you are doing, finding a creative way to get them to participate will make them feel part of the experience. Remember that home is where your children receive love and security. It needs to be a place where they can grow and flourish and, most importantly, learn. By creating a nurturing personal space for your children, you will help them become inquisitive, independent and self-confident adults who will remember their childhood and home with love and affection.